"Should parents have the right to refuse or limit a 1:1 initiative – or other educational technology usage – for their children? If so, in practical terms how would that work (e.g., would schools be required to provide analog assignments and/or homework)? What do you think?" When it comes to supporting parents here in Burlington, my typical response is "we own the device, but you own the child." We need to try to work with parents to help them ensure that they can find the balance of screen-time that they feel is warranted for their children. The problem here, however, is that this is far from a black and white issue due to the fact that most debates on this topic we tend to leave out the purpose of the time that students spend online. Personally, I think there is a difference between a couple of hours spent researching and creating a multi-media project as opposed to a couple of hours spent playing candy crush. "Keep in mind, the child being able to say, "I'm working on my homework" is somewhat of a game-changer when it comes to supporting and setting limits. 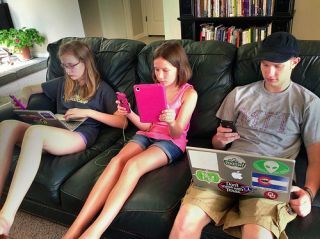 How easily could you tell your child to just put the technology away when it could be impacting their grades?" It is definitely worthwhile to read all of the 32 comments from Scott's post. There is so much more to talk about on this topic. I particularly like the direction that Lyn Hilt takes the conversation in her comment about ensuring that work assigned as homework (whether on a device or not) is meaningful. However, I'll leave that for a discussion on another day.